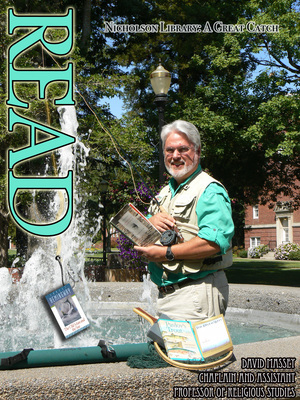 David Massey, Chaplain and Assistant Professor of Religious Studies, reading A River Runs through It, by Norman Maclean. Terry, Paula and Nicholson Library Staff, "David Massey READ Poster" (2009). READ Poster Gallery. Image. Submission 59.